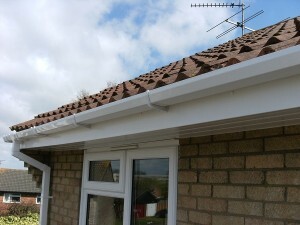 We’ve been installing replacement fascias, soffits & guttering for clients across Suffolk for over 10 years. Years of exposure to moisture and temperature changes can leave the joints of your home exposed to rain and condensation, which are notorious for their ability to cause rotting and decay. It’s therefore vital, to keep your rafter and joist ends in good condition. Properly fitting fascia and soffit boards will protect the rafter and joist ends from the ravages of tough British weather. There are, of course, many options available to you that will allow you to protect your home from water damage. You can commit yourself to replacing your roof timber and siding on a regular basis, although this is an extremely costly and inconvenient option. You can always choose to repair and re-paint your timber but that’s not only time consuming but also VERY expensive, not to mention potentially dangerous if you are performing the work yourself. Not only is the product superior to any other building materials on the market, our team of experts will ensure that it is installed to the highest standards to ensure that your home is protected and looks incredible. 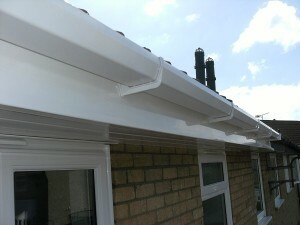 Properly installed PVCu Soffits and Fascias will protect your property for years without the need for ongoing maintenance. 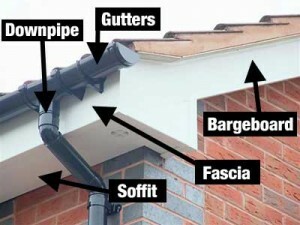 At FIS Windows, we have a fantastic range of replacement fascias, soffits and guttering to suit every home. Make your choice from the selection of colours and designs all created to complement our full range of windows and doors. We are dedicated to creating a completely new look for your home at extremely affordable prices. We want you to be as proud of our final product as we are, and we are willing to go the extra mile to ensure that you are completely satisfied with our installation.